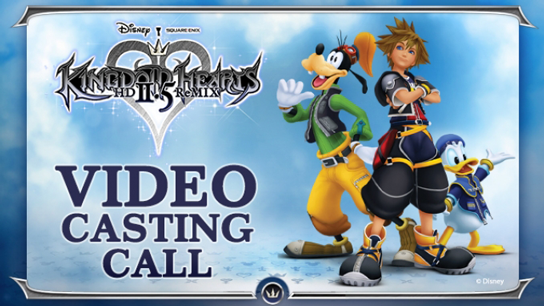 Square Enix is giving fans a very special (and limited) opportunity to be in a special video collaboration to talking Kingdom Hearts HD 2.5 Remix! With PAX Prime approaching us Square Enix has given us a brand new trailer featuring Kingdom Hearts HD 2.5 Remix. Kingdom Hearts HD 2.5 Remix has been officially rated by the ESRB which is the Entertainment Software Ratings Board that provides ratings guidelines for any video games that are sold. Kingdom Hearts HD 2.5 Remix was featured in this week’s Famitsu Weekly particularly for Kingdom Hearts Birth By Sleep in its glorious HD. They show off lots of images including Aqua’s battle with the “Hunter of the Darkness” from the Final Mix version of Birth By Sleep. MeriStation, a popular Spanish website, had an opportunity to sit down with Kingdom Hearts HD 2.5 Remix’s co-director Tai Yasue following Gamescom 2014. In the interview Yasue discusses Spanish dubs with Kingdom Hearts HD 2.5, localization with Kingdom Hearts X[chi] and his own personal choices for worlds in Kingdom Hearts III.